Shrewsbury Town boss Micky Mellon says he will look for a defender in the loan market after admitting his team are struggling without Connor Goldson. Goldson, 22, joined Championship side Brighton in August and Mellon says his side are missing the impact he brought. Shrewsbury have conceded six goals in their last two matches and lie in 19th place in the League One table. 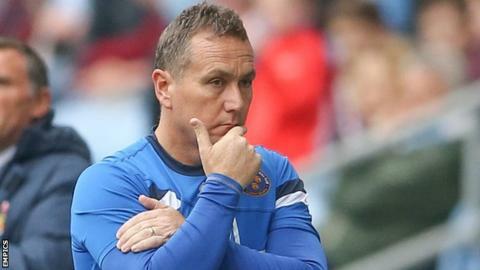 "We want a good communicator and leader that can marshal that back four," Mellon told BBC Radio Shropshire. Of the 15 goals that Shrewsbury Town have conceded in League One this season, nine have come in the second half of matches. "We've lost a leader, there's no doubt about that. We've lost somebody to pull the back and organise the back four. "I want to strengthen in all areas but I think it would be fair to say that is a big hole we would do well to fill. "We need that character back in the back four which we've missed with the loss of Connor and it has been massive." Goldson has yet to make an appearance for his new club since leaving Greenhous Meadow.